The Byre Cottage. An inspiring place to stay, converted by Giles it is ecologically aware, has natural elm in the kitchen, a smart modern bathroom and has a light and airy feel. This self-catering cottage has vaulted ceilings, a wood burning stove and solid oak flooring. High quality superking beds will ensure a relaxing holiday. There is a west facing patio in the enclosed steading courtyard. 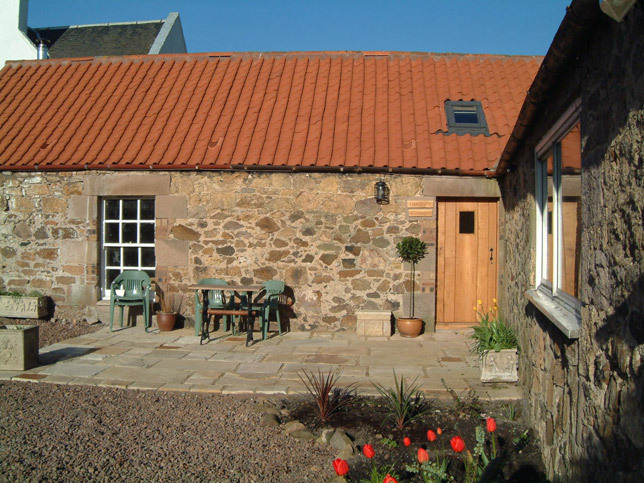 The Byre Cottage, East Lothian. This self-catering Cottage dates back to the 18 century. It was recently converted to a comfortable self catering cottage, retaining its natural charm. Only 4 miles from the sea and award wining sandy beaches it is the perfect place to stay and enjoy nearby castles, Bass Rock, North Berwick and plenty of golf! The 43 miles of coastal walks will exhaust old and young and Edinburgh is only 25 mins away by train from the local train station just down the lane. You can book our cottage directly through Holiday Lettings. Deutsch Besucher benutzen Sie bitte diese Seite für Ihre Buchunge. Or simpy send us an email or give us a call to see if the cottage is still available. We're love to hear from you.